Prior to AquaLife Complete, no single water conditioner did the best job of relieving stress, removing chlorine, removing ammonia, and could be used for emergency ammonia or nitrite removal. AquaLife Complete has changed everything. Make no compromises. 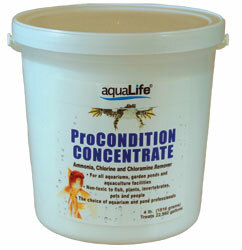 Use the ultimate water conditioner available for your pets. It does make a difference. AquaLife Complete is the most advanced all-in-one water conditioner and stress reliever on the market. Specifically formulated for the hobbyist with a serious commitment to keeping livestock thriving and healthy, AquaLife Complete is concentrated to deliver twice the results of other conditioners while reducing the chance of illnesses associated with stress. DIRECTIONS: To fully condition water for (1) new aquariums or ponds, (2) before, after or during water additions, or (3) before adding new fish, amphibians, or plants, add 1 teaspoon (~5mL) to AquaLife Complete Water Conditioner per ten (10) gallons of water. For larger applications use the following dose: 1 fl oz per 60 gallons of water. For nitrite removal, dose as directed, then test water for nitrite. If nitrite persists, add a second dose and test again. RECOMMENDATIONS: Perform regular water changes to keep the alkalinity (acid-neutralizing capacity) and pH stable. Use AquaLife Complete Water Conditioner as needed to eliminate and control ammonia at the regular dosage rate for each 1mg/L, or fraction thereof, of measured total ammonia or for each 0.85mg/L of measured ammonia-nitrogen. Use a salicylate (indophenol) type total ammonia test kit for testing. For dissolved-oxygen (DO) testing, use either a DO meter or an indigocarmine test. It may be used at the standard dose to stop or destroy permanganate treatments. CONTRAINDICATIONS: Do not use with permanganate-based or chlorite based treatments. Nessler's total ammonia test will give false high (or off scale) readings. Winkler dissolved oxygen test will give false, low (or zero) readings. INGREDIENTS: electrolytes, buffers and a proprietary polymer formula in aqueous solution.